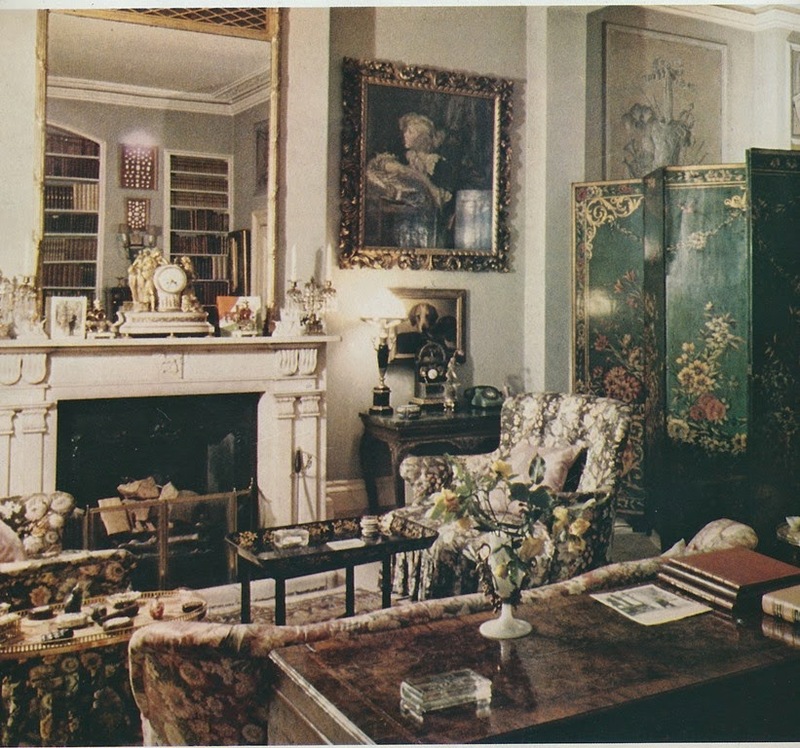 If you have read Rooms, the compilation book of photographer Derry Moore's interior photos, then you likely remember the London home of Lady Diana Cooper. 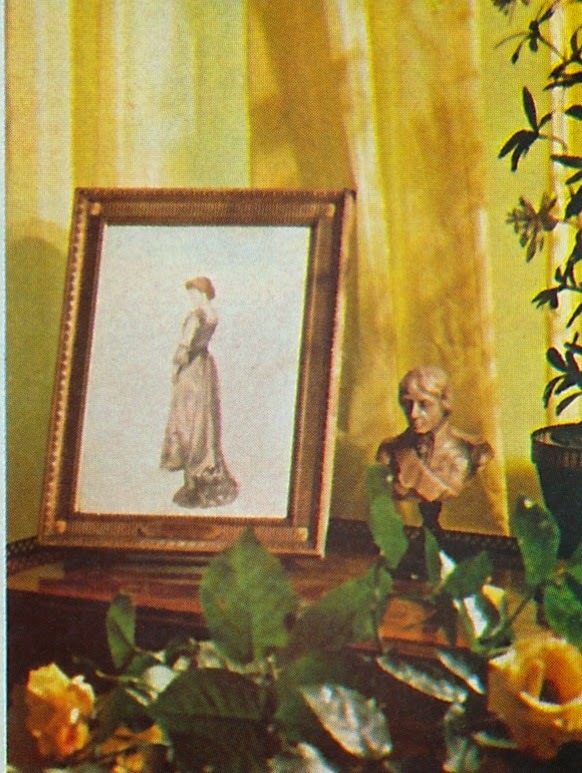 Moore's photos of the Cooper residence, which was located in the Little Venice section of London, were memorable to me for me two reasons: Cooper's Martin Battersby-painted trompe l'oeil panels, which graced her dining room walls, and her jaunty yachting cap, which Cooper wore as she posed for the famed photographer. 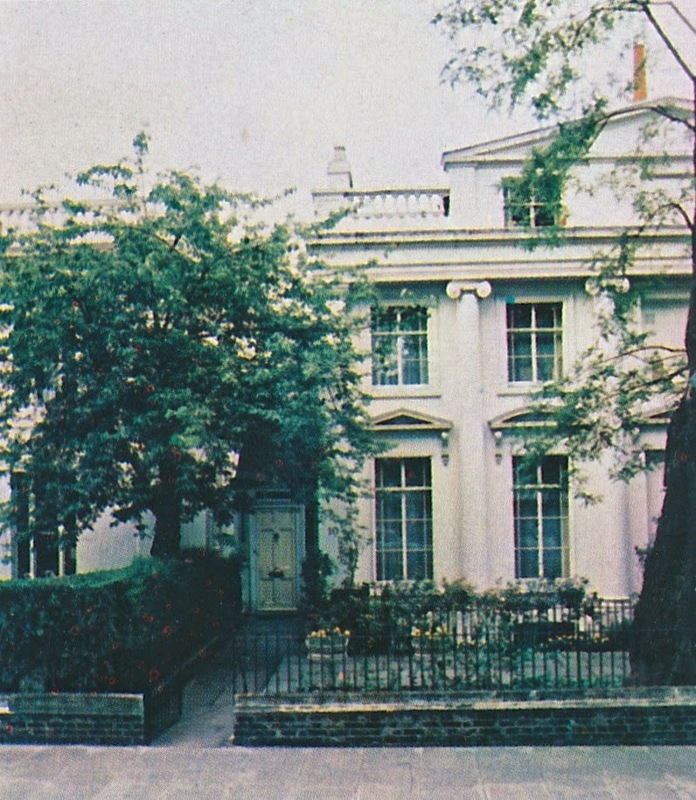 Thanks to a kind reader of mine, I recently found these c. 1970 photos of Cooper's Little Venice home. 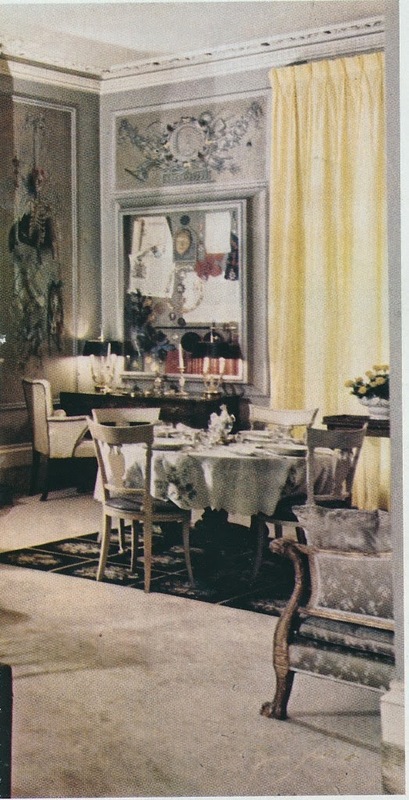 As you can see, her living room and dining room formed one large space, which was divided by a painted floor screen. Further delineating the dining area were the Battersby trompe l'oeil panels, which created a rather striking setting for dining. The living room appeared to be more relaxed than the dining room and, well, more British thanks to the chintz-covered chairs and sofa. It's worth studying Cooper's myriad objects and art. 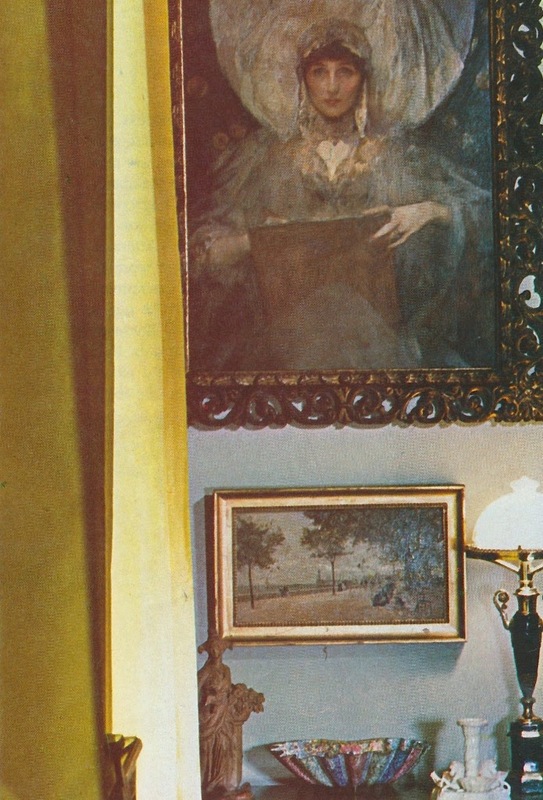 To the right of the living room fireplace was a J.J. Shannon portrait of Cooper as a child. 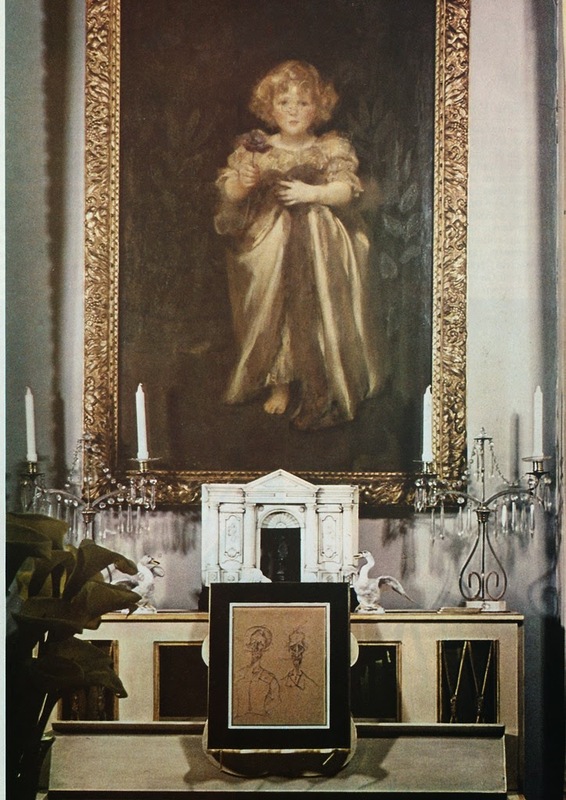 Other displayed Shannon portraits included those of Cooper's mother, Violet, Duchess of Rutland, and an infant Cooper. 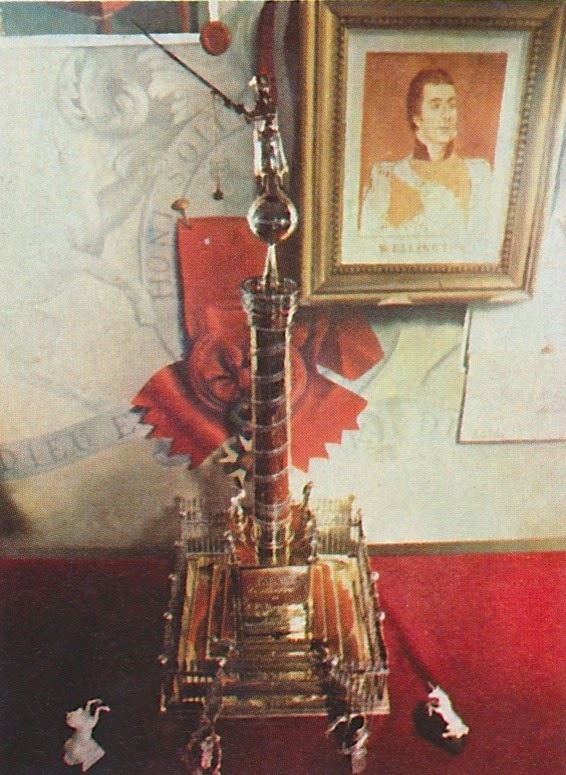 A gold doré miniature of the Vendôme Column, which could be found in the dining room, was a gift to Cooper from Louise de Vilmorin. (Their complicated relationship is a story for another day.) 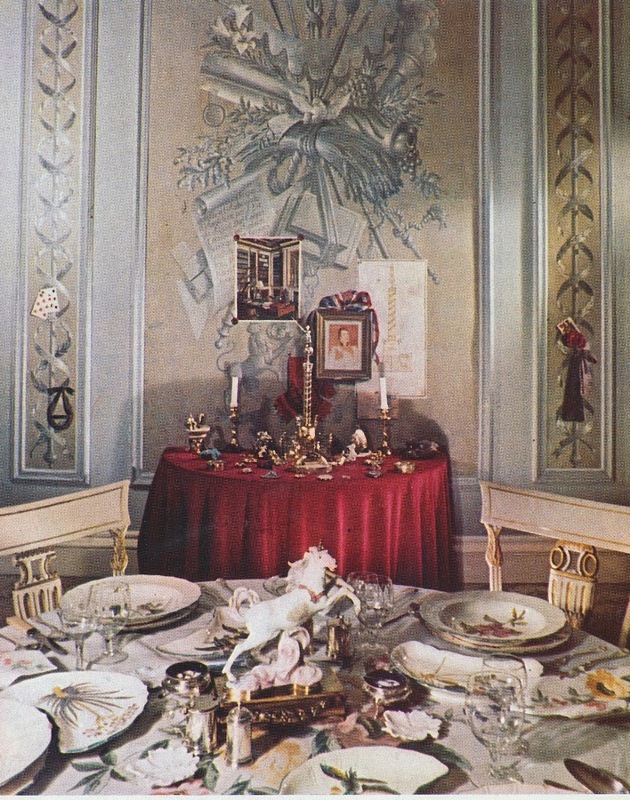 And the unicorn, which was a symbol of sorts to Cooper, appeared as a dining table centerpiece as well as in a Jean Cocteau illustration. 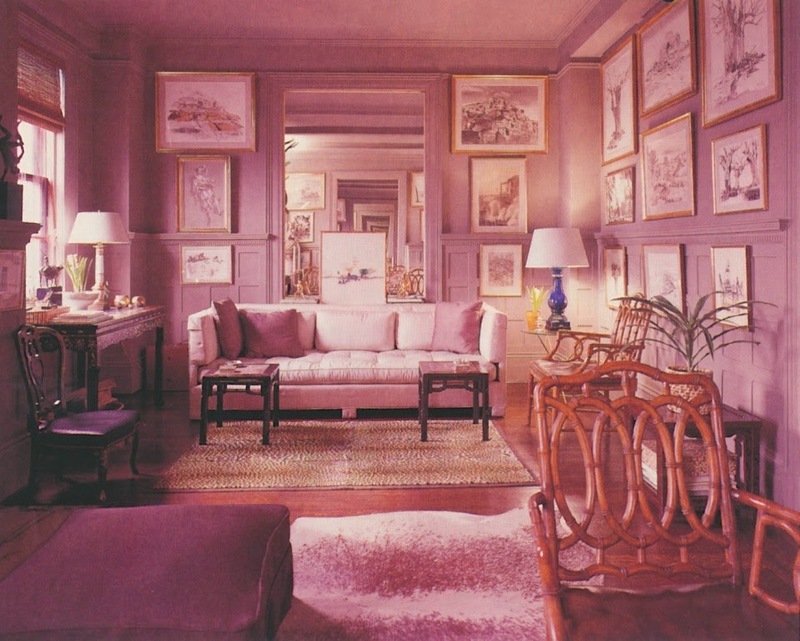 These photos might be forty years old, but isn't it refreshing to see a home whose interiors don't seek to impress through impertinence, flamboyance, or ill-advised efforts at originality? 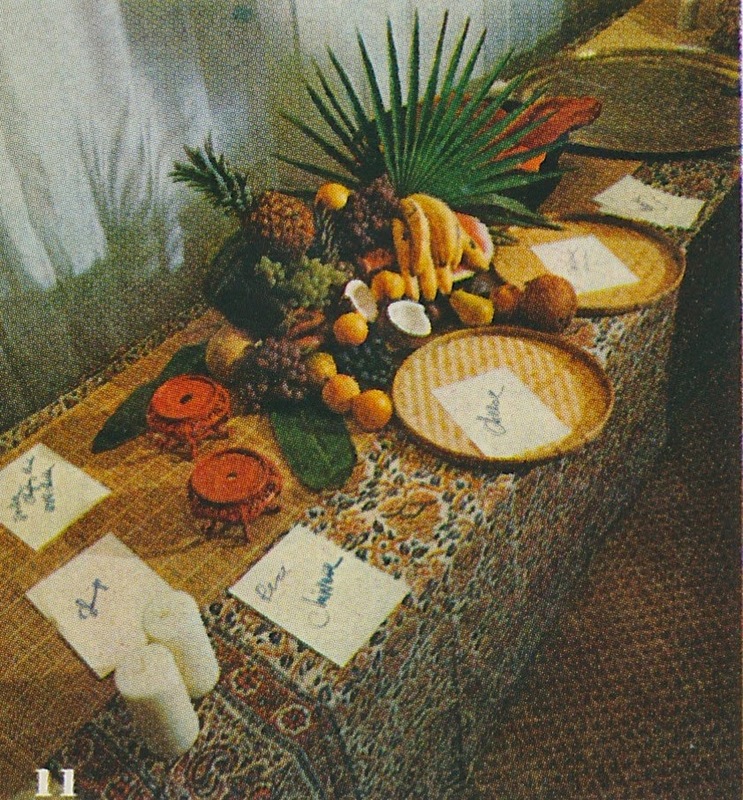 The two photos, above, show Cooper's dining room. 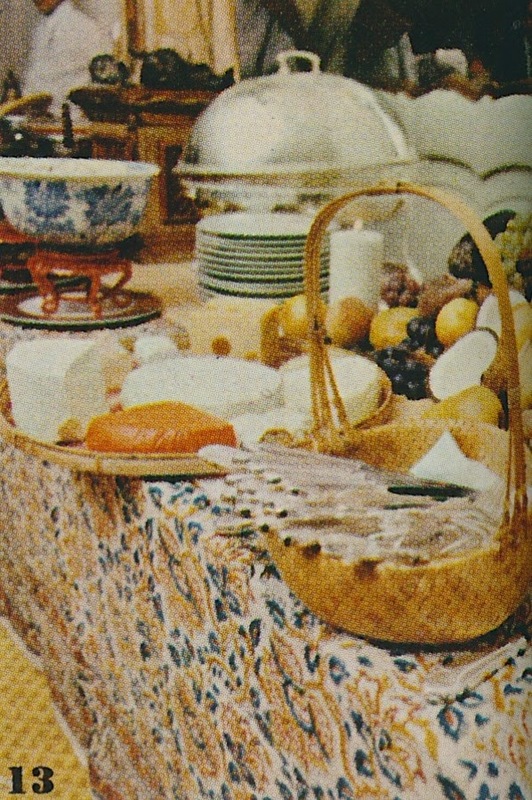 Situated in the center of the red fabric-draped table is the gold column that was given to Cooper by Vilmorin. J.J. Shannon's portrait of an infant Diana. 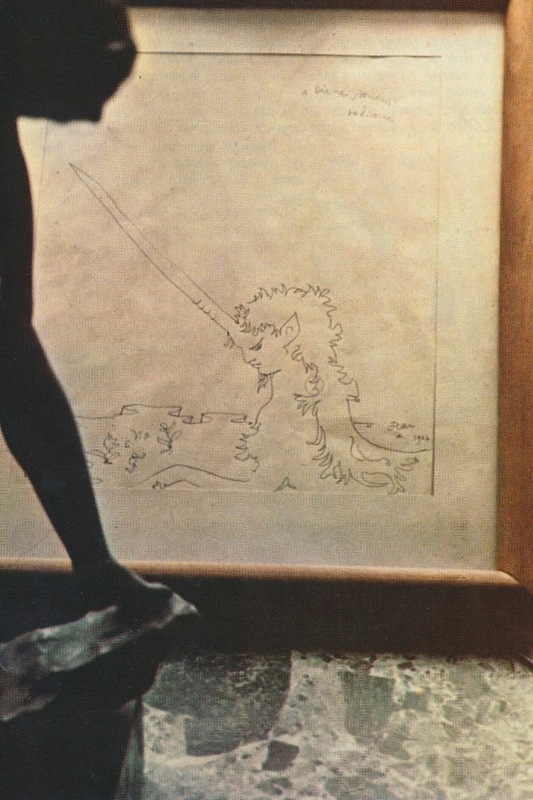 Cocteau's unicorn illustration. The inscription reads, "A Diana, souvenir des licornes. Jean 1946." Shannon's painting of Violet, Duchess of Rutland, who was Diana's mother. A close-up of the Vendôme Column that was surrounded by tiny unicorns. An illustration of Diana's mother. Back in December, I attended the launch party for the Atlanta opening of Pirch. In case you are not familiar with it, Pirch is a national kitchen, bath, and lifestyle retailer with showrooms around the country. (Look for new showrooms to open in Paramus, New Jersey this year and in New York City next year.) Before I toured the Atlanta store, I had heard of the Pirch brand but knew little more than the name. What I wasn't prepared for was the excitement I felt as I looked at ranges, faucets, vent hoods, and bathroom sinks. Who knew that I could get so giddy over the prospect of scrambling eggs on an outdoor flattop grill? 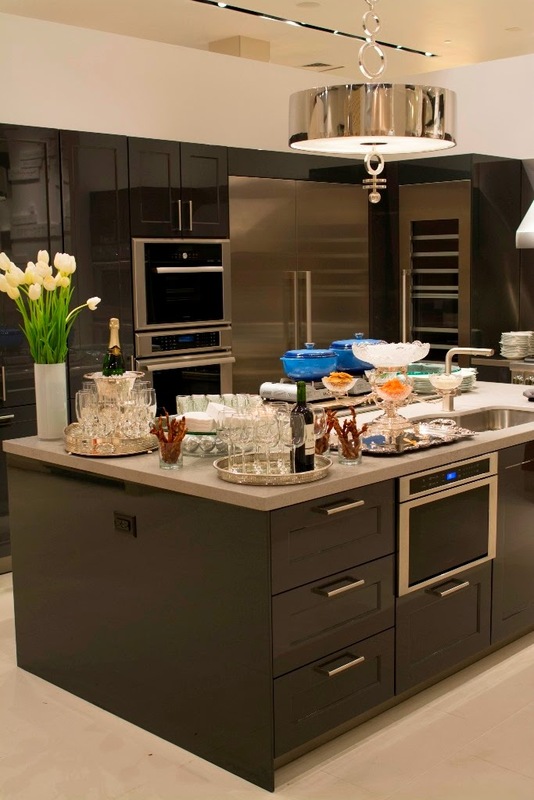 Pirch carries an impressive range of high-end kitchen appliances and bath fixtures, with such brands as La Cornue, Bertazzoni, American Range, and Gessi making appearances. But what makes Pirch unique is that the customer is encouraged to test out the products before purchasing them. If you're curious about what kind of water stream will emanate from a shower head, simply turn it on as most of the showroom's faucets and shower heads actually work. Are you leaning towards purchasing a La Cornue range but are unsure of its capabilities? No problem. 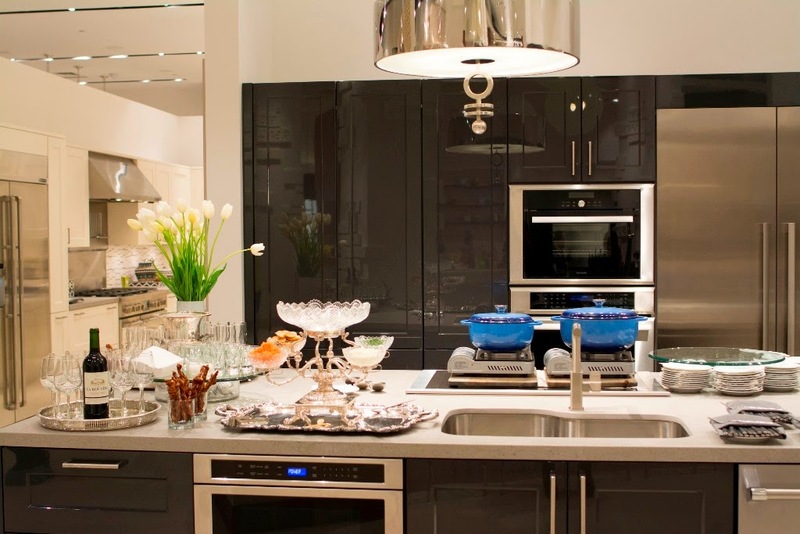 Pirch will connect that range in their test kitchen and have their in-house chef instruct you on how it works. It's like taking a car on a test drive before buying it. Now do you see why I found my tour so inspiring? As someone who cooks on a 1968 cooktop (I swear) and whose bathroom still has its original plumbing fixtures, I wasn't really aware of all of the recent innovations in kitchen and bath technology. There are now so many options in terms of color, materials, and finishes, not to mention all of the bells and whistles that help to make cooking and bathing more efficient and luxurious, too. After I finished my tour, I came to the conclusion that it is high time for me to liberate my kitchen and baths from their 1968 shackles and outfit them in Pirch-style. If you're in the same boat as me, or if you simply wish to see and test out the latest in bath fixtures and kitchen appliances, then I encourage you to visit a Pirch store soon. Trust me. You'll walk away feeling inspired. Cookbook author and Atlanta native Alex Hitz was the featured chef at the launch party, hence the sterling silver and crystal epergne and the scrumptious food. The reflective finish of these cabinets caught my eye because it has a slightly 1930s-look. 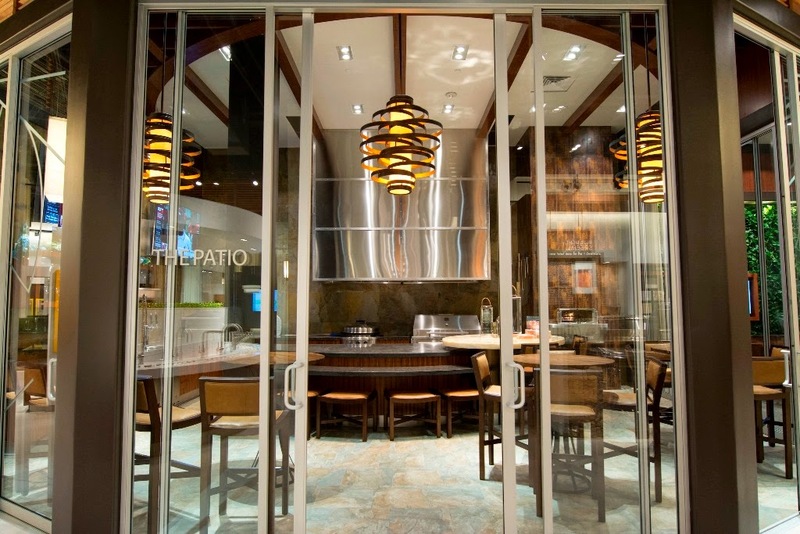 "The Patio" is Pirch's showcase for outdoor cooking equipment, including the flattop cooking grill upon which one can fry eggs and bacon. See what I mean about bells and whistles? Some of the ways with which you can turn your bathroom into a spa. All photos taken by Jennifer Boles with the exception of #2, 3, and 8, which were taken by Kim Simons. Jealousy reared its ugly head last week as I was perusing the February issue of House Beautiful. It was while reading the article on designer John Peixinho's attractive Newport house that I about fell out, so to speak. 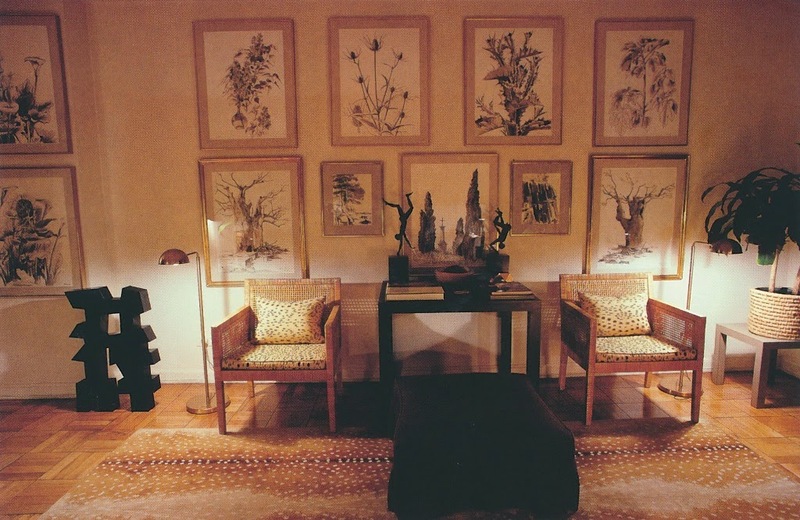 Right there on page 78 was a photo of Peixinho's dining room, which featured a wall devoted entirely to wash drawings by designer Van Day Truex. To someone like me who covets Truex's drawings (and who dreams about the day I own one of my own), this photo was simply awe-inspiring. In fact, I believe that the moment I saw this photo, I heard the proverbial choir of angels sing. Of course, I'm not really jealous of Peixinho and his enviable collection of Truex art. Rather, I admire his keen eye and his good taste. 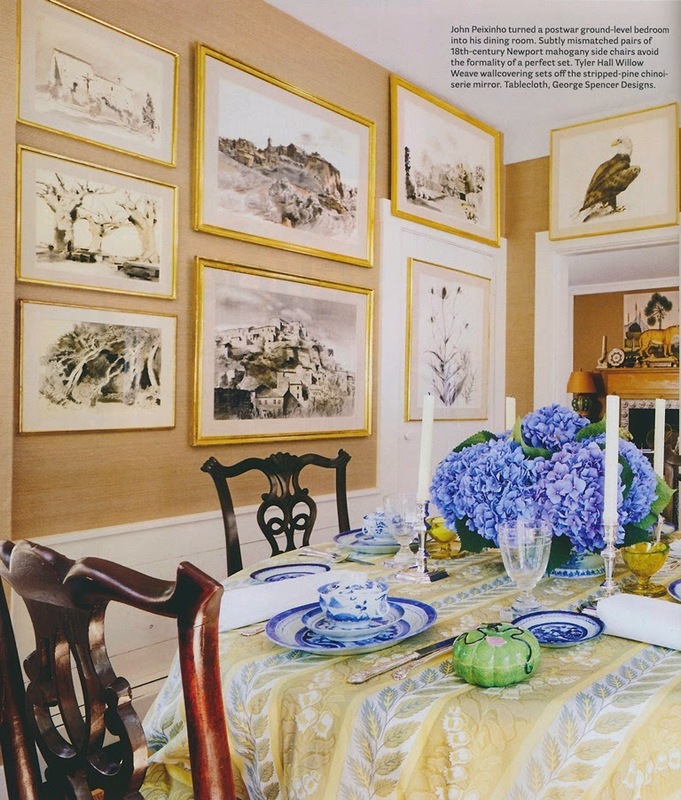 The House Beautiful article mentions that one of Peixinho's Truex drawings (seen in the second photo, above) had originally been painted for Brooke Astor. I don't know the extent of Astor's collection of Truex drawings, but I do know that at least two were sold at the mammoth Brooke Astor Sotheby's sale in 2012. 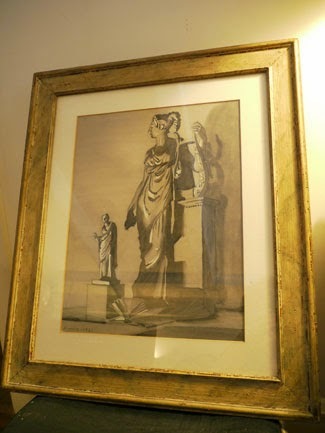 Another person who owned an enviable collection of Truex drawings was Albert Hadley, who was Truex's great friend. 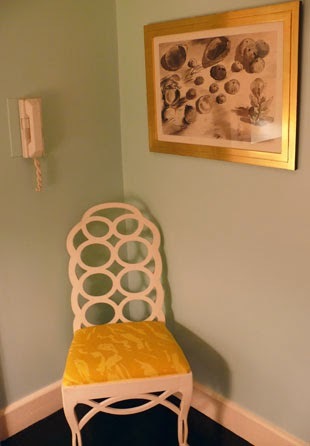 Hadley had a number of his friend's drawings on display in both his Manhattan apartment as well as his Connecticut house, and he even included Truex's drawings on an Elle Décor-published list of the designer's favorite things. 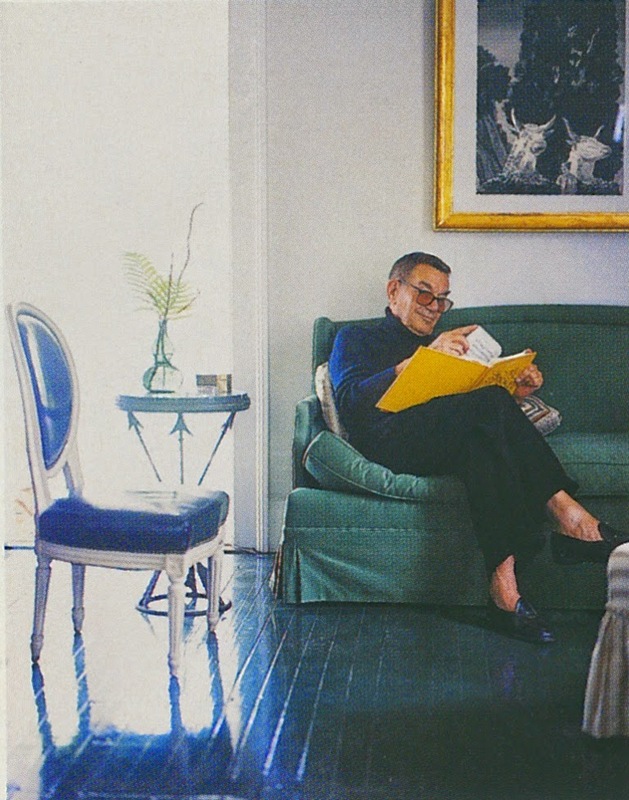 If you wish to learn more about Truex and his drawings, then you must read Adam Lewis's wonderful biography of Truex, Van Day Truex: The Man Who Defined Twentieth-Century Taste and Style. And speaking of Lewis, he also owns a couple of Truex drawings, which you can see below. 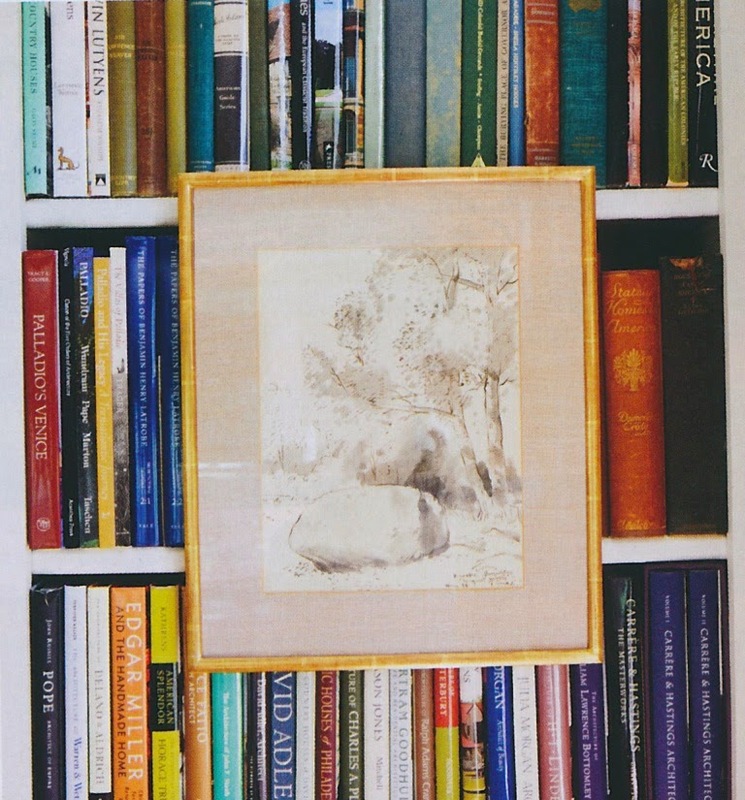 And rounding out this brief list of Truex collectors is Christopher Spitzmiller, whose Truex drawing graces the foyer of his Manhattan apartment. Look closely at the photos below, and you'll see that Truex drawings seem to get passed down amongst friends, which is really as it should be. 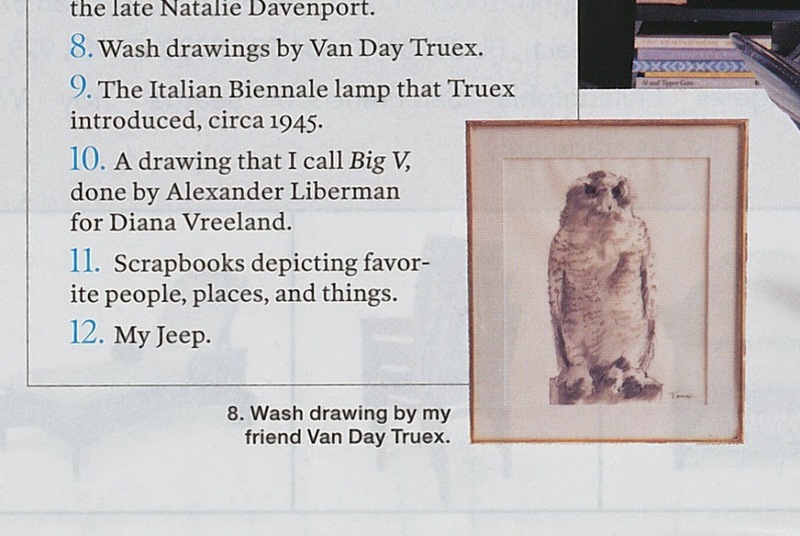 Van Day Truex wash drawings in the home of Van Day Truex. ...and in his Connecticut home. Albert Hadley even included the wash drawings on his list of favorite things. 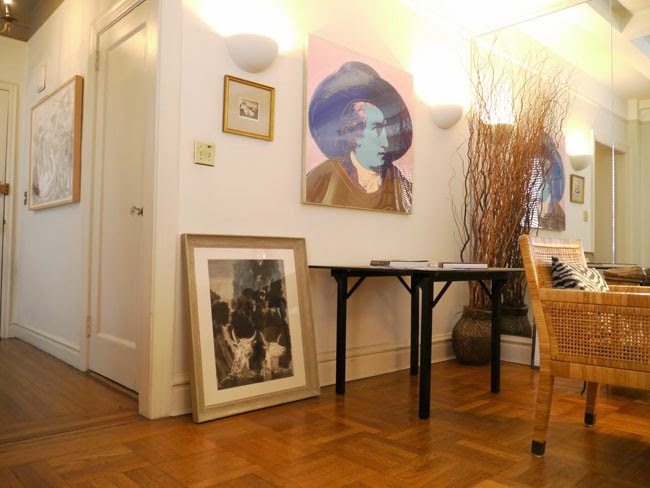 Two Truex drawings in the Manhattan apartment of Adam Lewis. 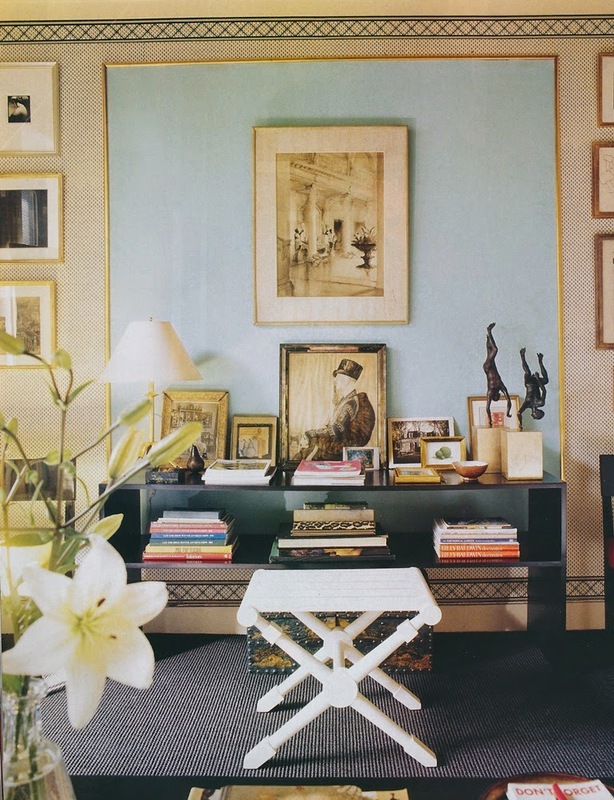 A Truex drawing graces the foyer of Christopher Spitzmiller's New York apartment. 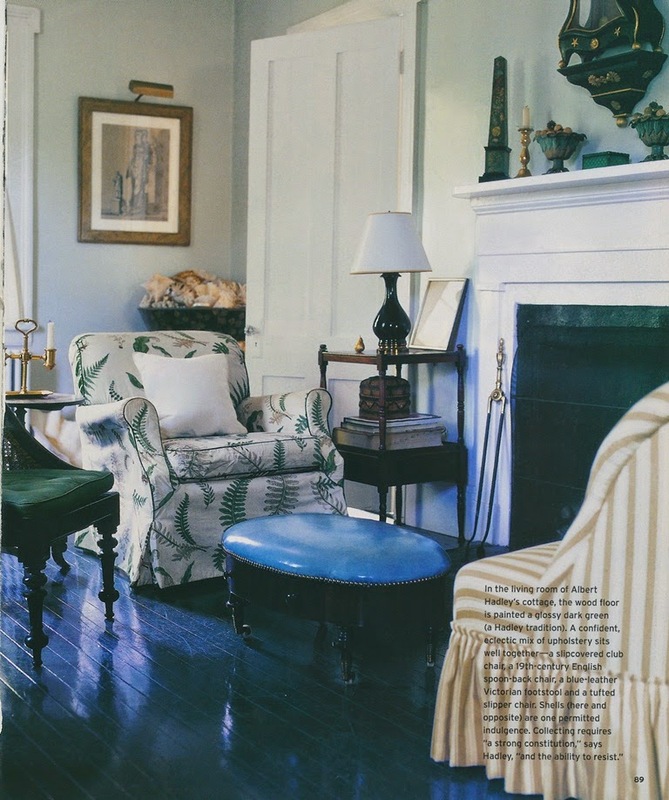 Images #1 and #2 from House Beautiful, February 2015, Thomas Loof photographer. 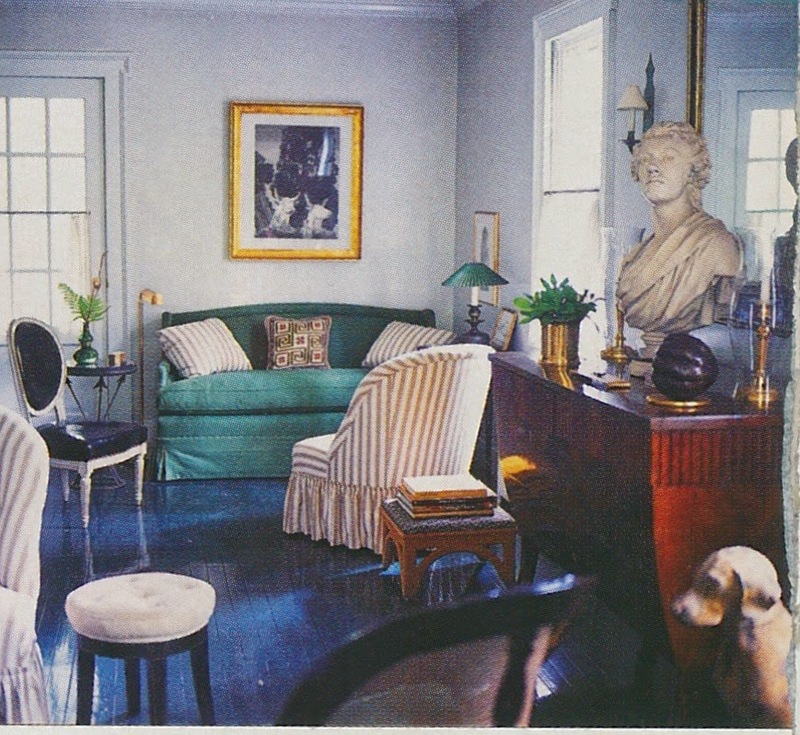 Truex apartment photos from Van Day Truex: The Man Who Defined Twentieth-Century Taste and Style by Adam Lewis. 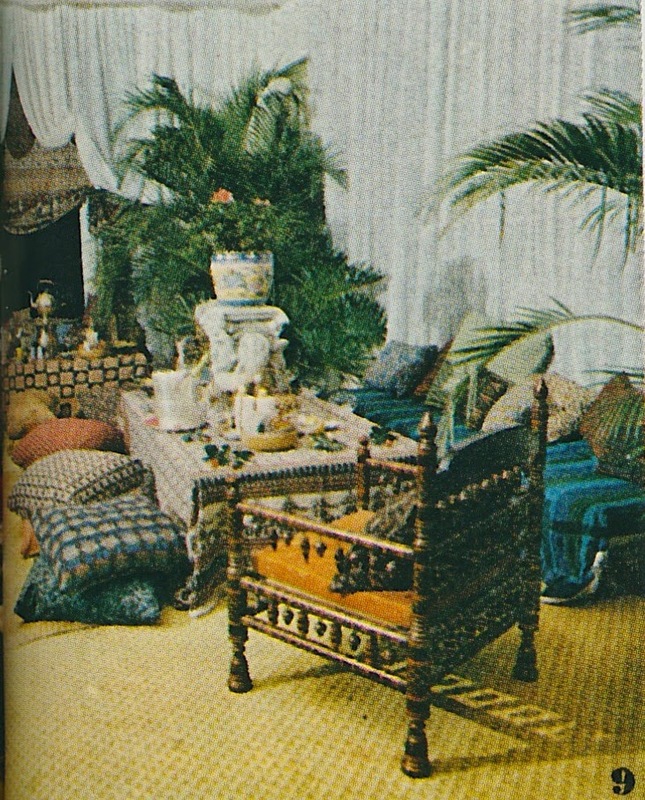 Photos of Hadley's Connecticut home from American Homestyle and Gardening, November 1999, Simon Watson photographer. Photos of Adam Lewis and Christopher Spitzmiller's homes courtesy of New York Social Diary, Jeffrey Hirsch photographer. Look at many of today's formally-decorated, French-inflected houses, and you'll likely find that the inspiration for their interiors was Versailles. Yes, Louis XIV's palatial exercise in self-aggrandizement remains influential in interior design, something which has unfortunately produced a mixed-bag of results. For any small-scale interpretation of Versailles to be successful, it must be reimagined with a modern sensibility. Otherwise, it won't be very livable. 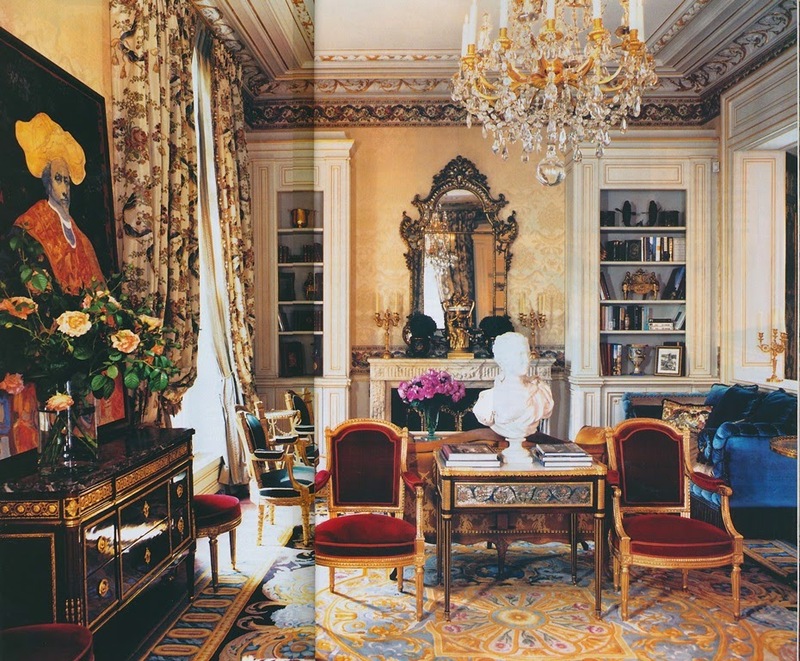 In the hands of a lesser designer, a Versailles-inspired home can be a flaming disaster. (You know what I'm talking about.) But, when such decorating is left to expert hands, the results can be delicious. 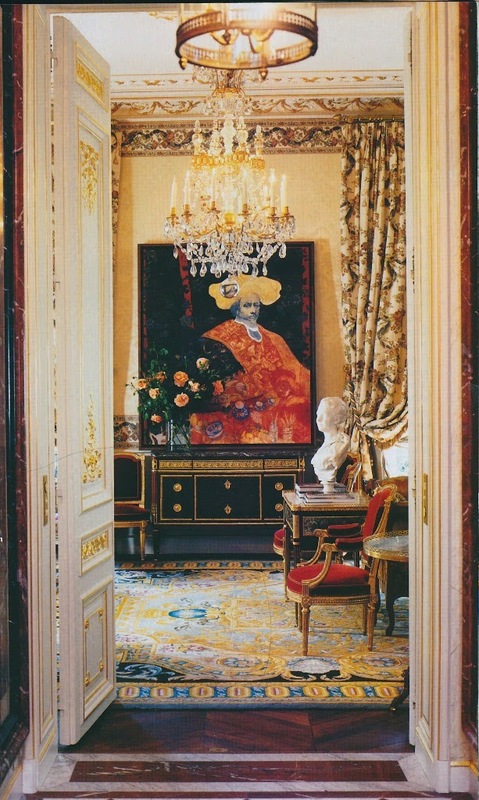 Take, for example, the Paris pied-à-terre featured here. Decorated by Jacques Garcia, a designer of great skill, and furnished with antiques from star dealer Luc Bouveret, the apartment might be grand, but it could hardly be called imposing. The homeowner, who, along with her husband, was based in New York, had long wished "to live in Versailles", a wish that Garcia worked hard to grant her. Walls and windows are lavished with sumptuous silks and damasks, while a contrasting color palette (light tones for the living room and dark shades for the bedroom) creates a sense of both brightness and intimacy. 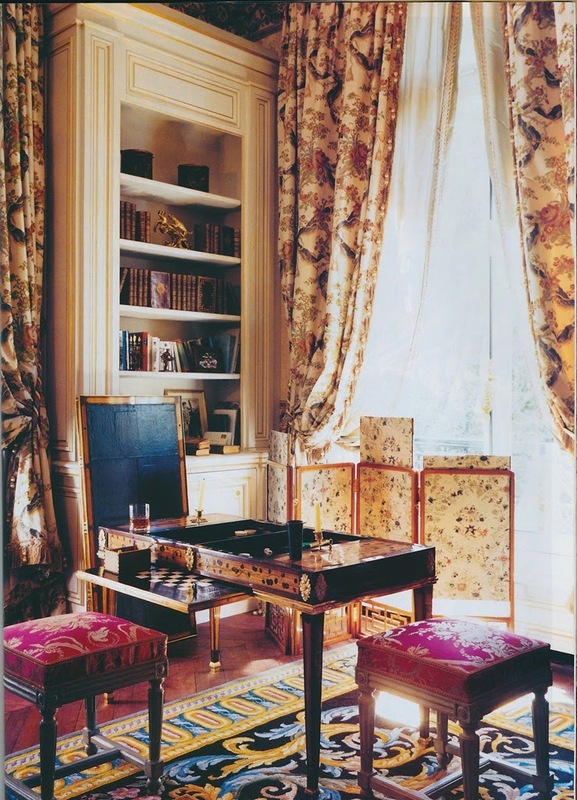 Although the antique furniture, which includes an Henri Wirtz marquetry games table and a rare desk with painted glass and silver-backed panels, is quite formal, it's not overwrought. 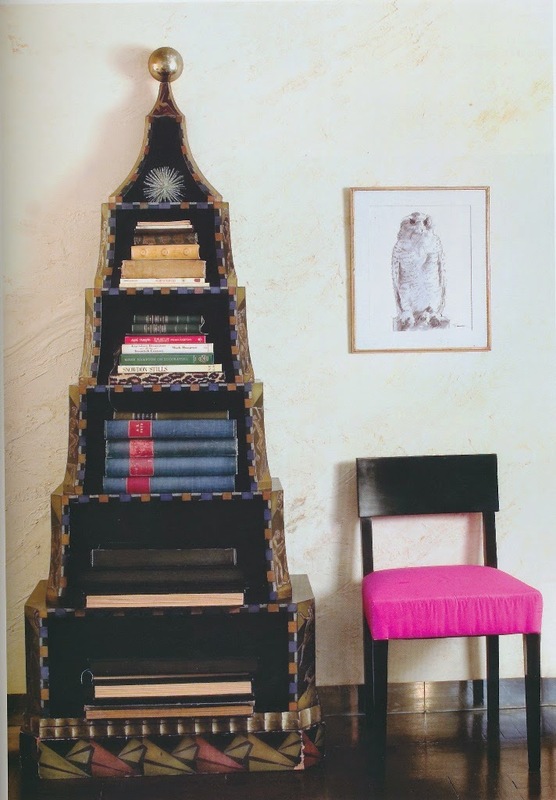 The furniture's mostly clean lines help to counterbalance the pattern that is found on both fabrics and rugs. 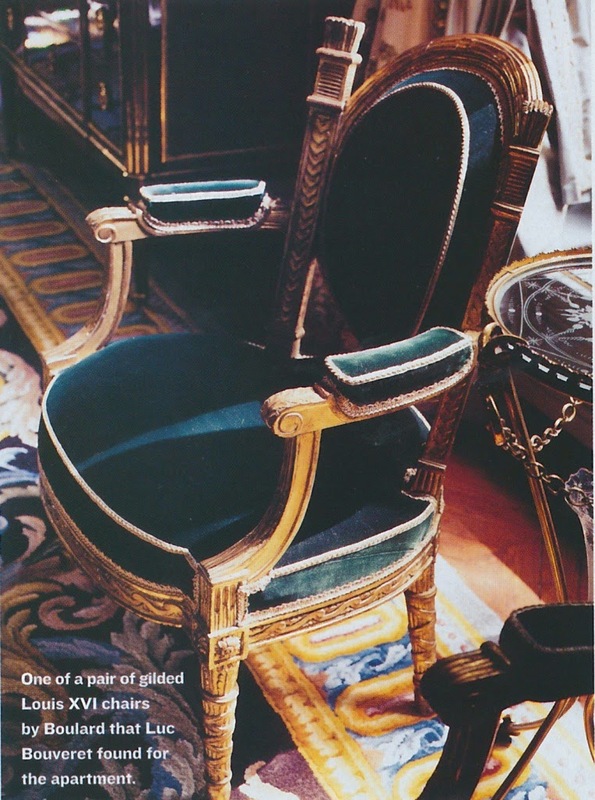 As Bouveret says of eighteenth-century French furniture, "There is a modernity to this furniture in its cleanness." 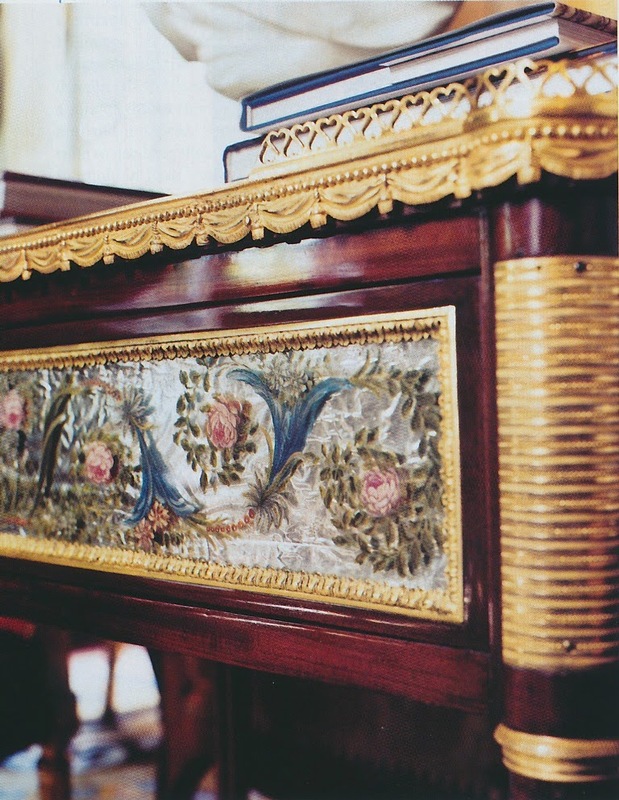 If only all Versailles-fueled decorating would produce such beautiful results. 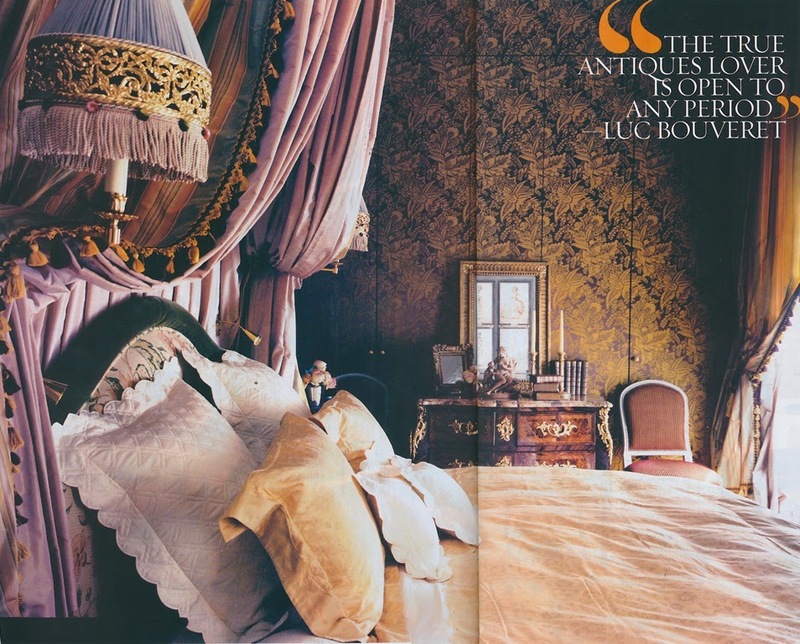 All photos and text from House & Garden, October 2002; François Halard photographer. Bear with me as I give you the back-story to this blog post. A month or so ago, I read decorative arts historian Haydn Williams's fascinating new book, Turquerie, with the intention of reviewing it on my blog. After I realized that the book had been featured in most shelter magazines, I decided that any review of mine would simply be redundant. I encourage you, though, to get a copy of Turquerie and read it. The book, which explores the 18th-century European fascination with Turkish culture and its influence on the decorative arts, is enthralling, but it's the text that makes it so. The book's images, no matter how sumptuous they are, will only tell you a fraction of the story. Shortly after reading Turquerie, I read Valentino: At the Emperor's Table. That book, of course, is about the designer's passion for entertaining, table settings, and luxurious china, crystal, and flatware. 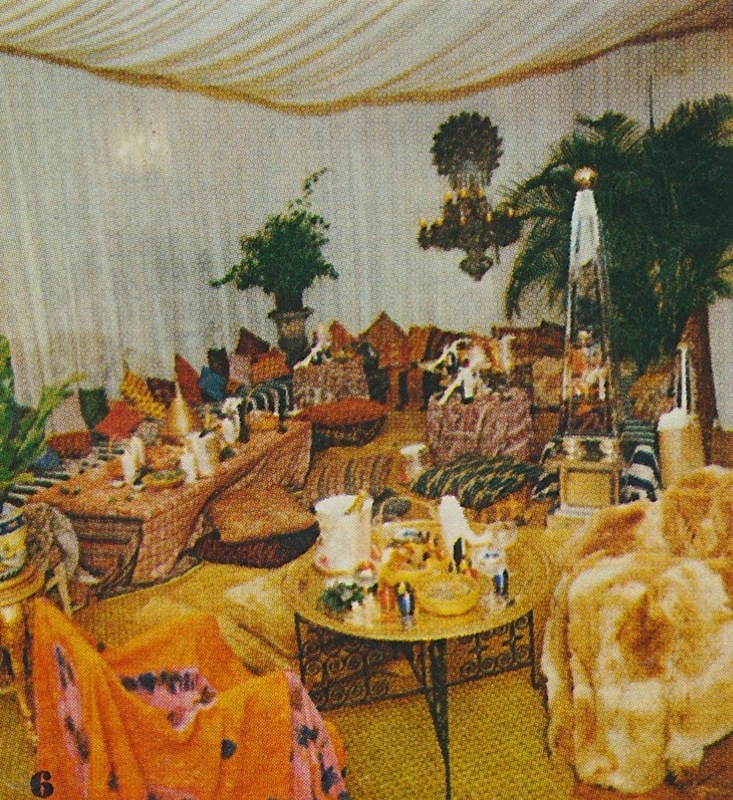 So, with Turkish fantasy and Valentino on the brain, I started to think about the designer's 1971 party (photos of which are seen here) that celebrated the opening of his New York boutique. 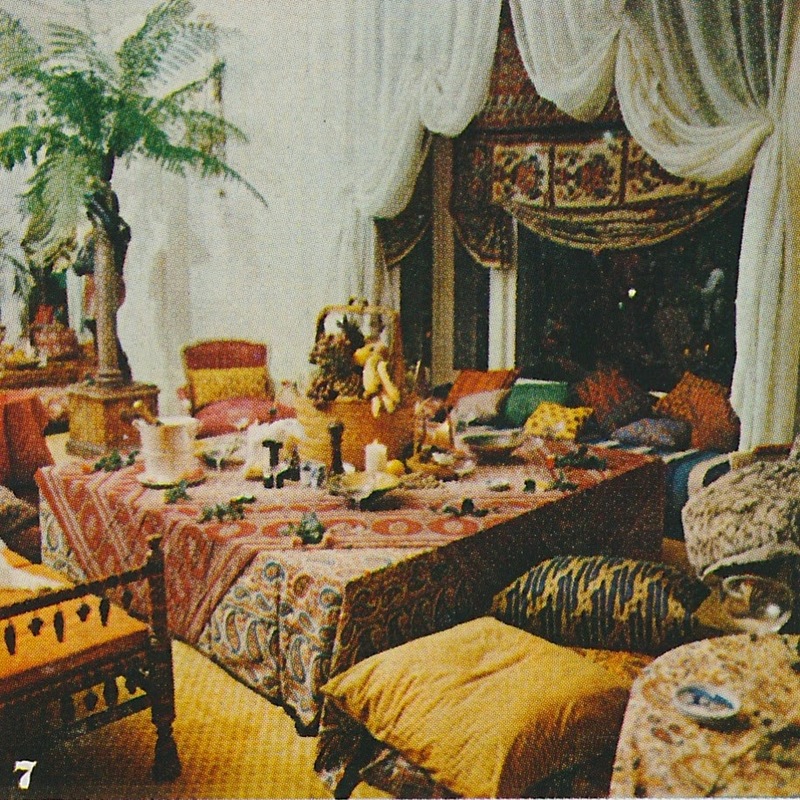 The party, which was held at The Pierre, was meant to be a "Scheherazade fantasy", according to the House & Garden article in which these photos appeared. 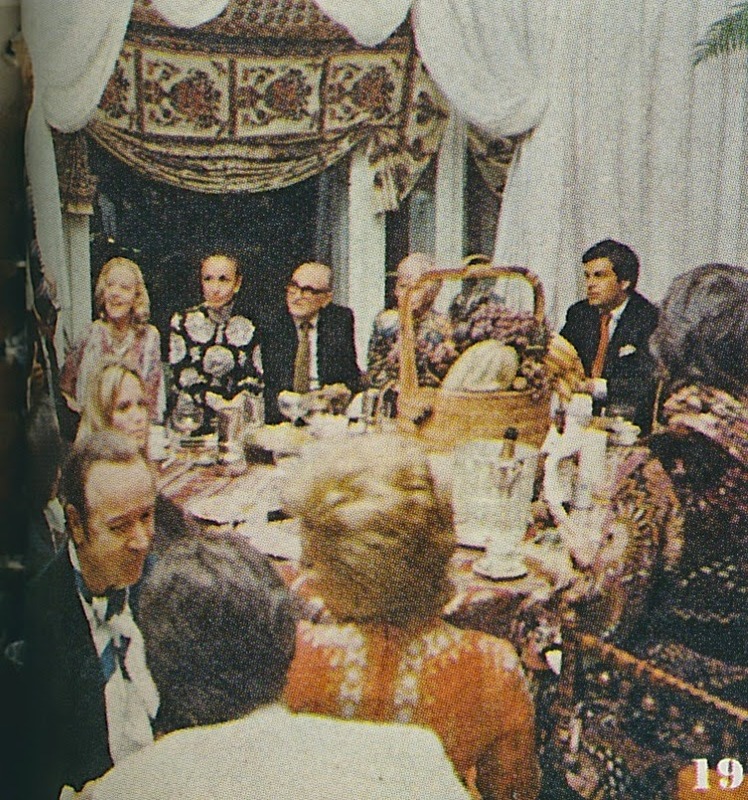 But once I read on, I realized that the party didn't totally stay true to its Persian roots. (Scheherazade, of course, was the Persian Queen and storyteller in One Thousand and One Nights.) 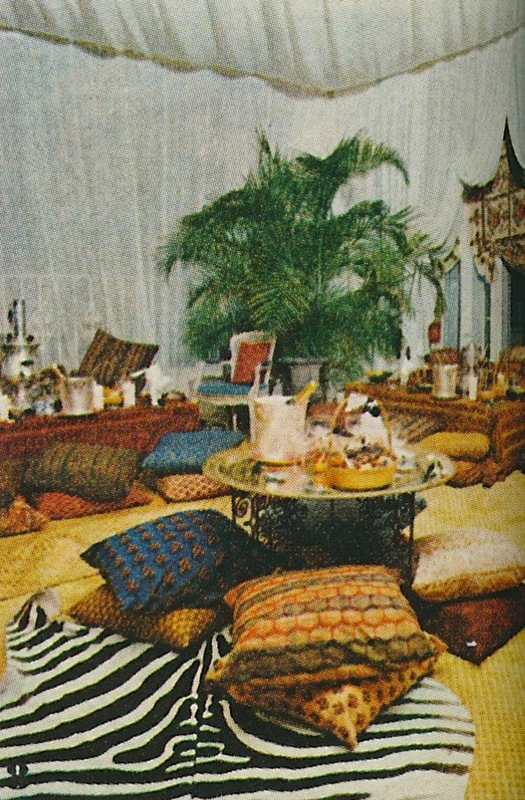 The party also featured Indian furniture, "Oriental" prints, a Chinese buffet, and Turkish coffee. 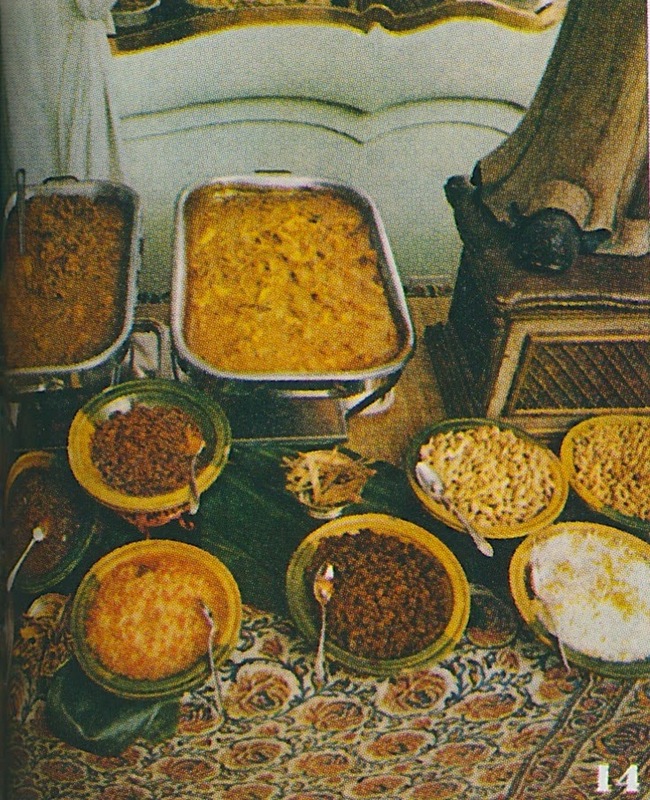 The article even made reference to "Little Egypt". 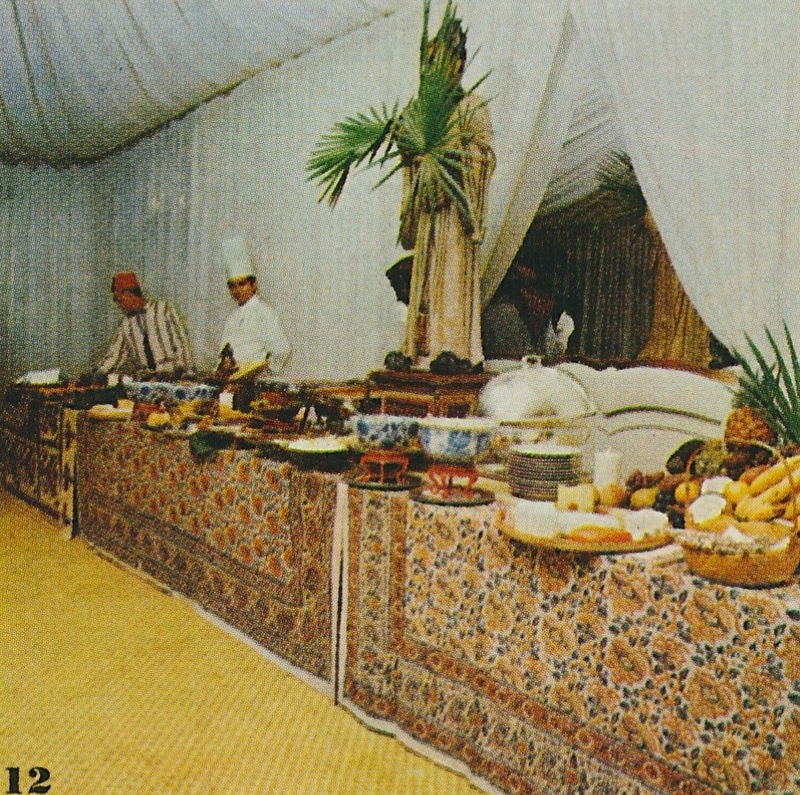 It seems that the party's décor and food borrowed from a number of exotic lands and cultures, something which made it one big fantasy. 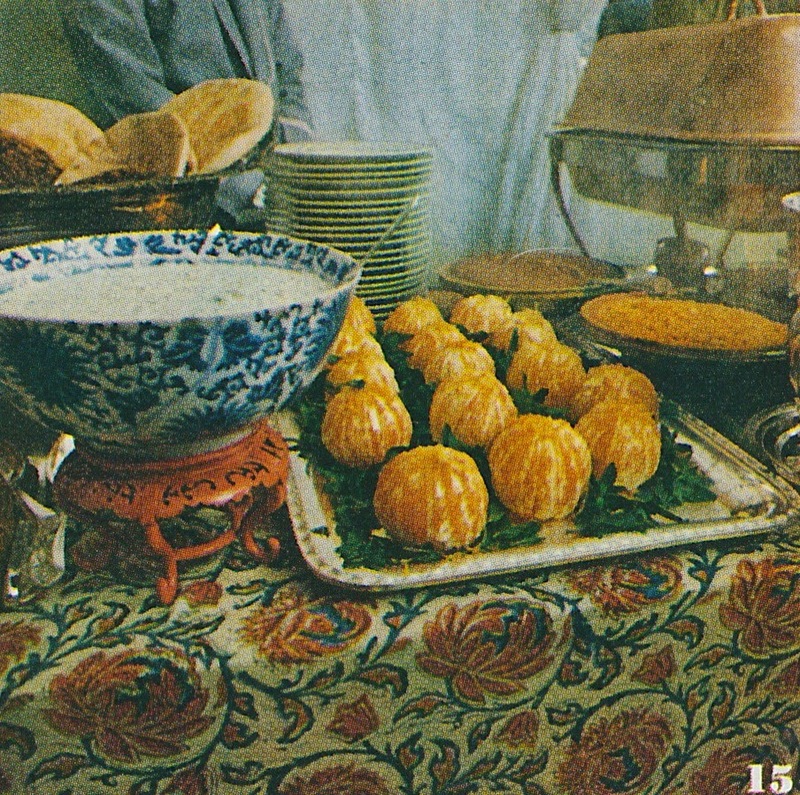 And if you read Turquerie, you'll learn that this creative approach to exoticism isn't new. 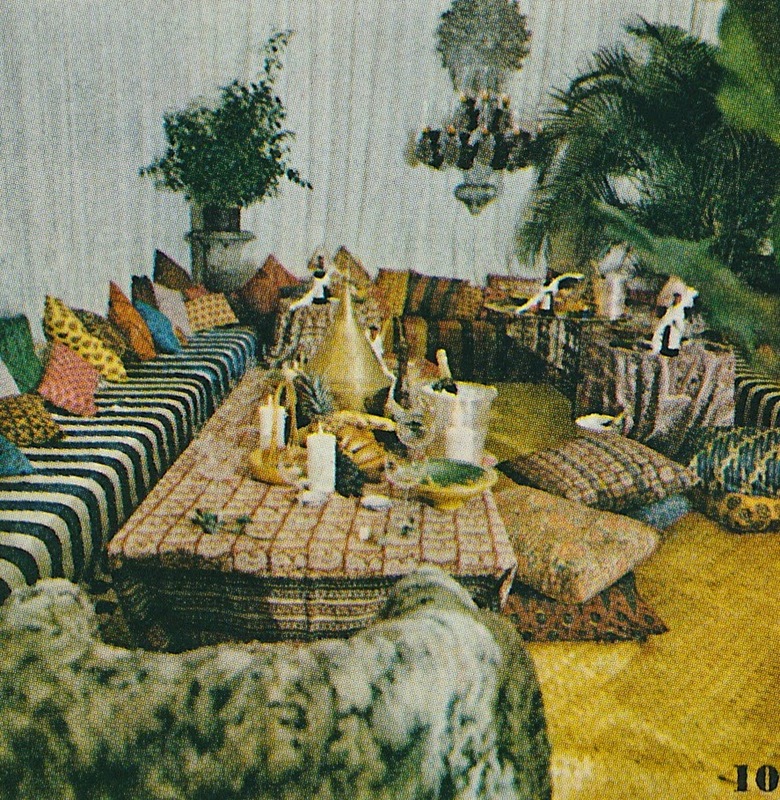 When it came to 18th-century exotic-themed art or décor, for example, it was often fantasy that trumped cultural accuracy. 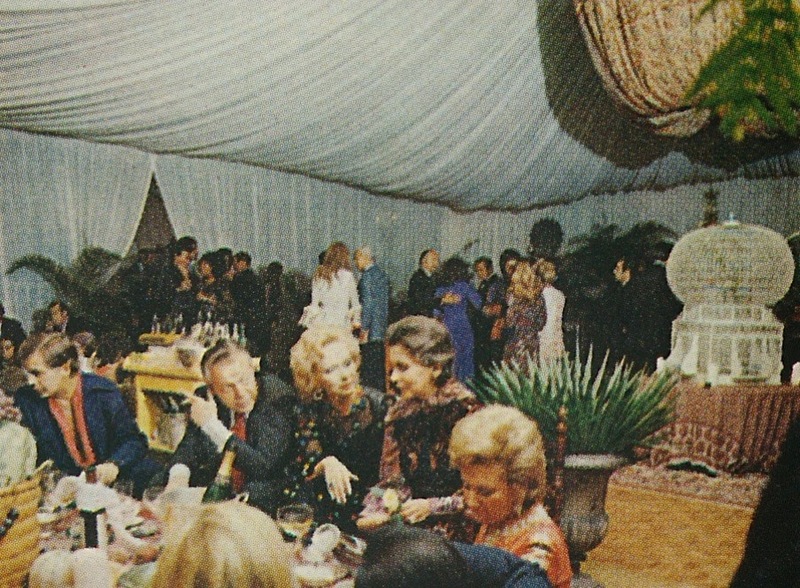 Now you understand why I have been pondering Valentino's party at The Pierre, not to mention the event's elaborate decor . I have to say that it looked like quite a party, if the first photo is any indication. 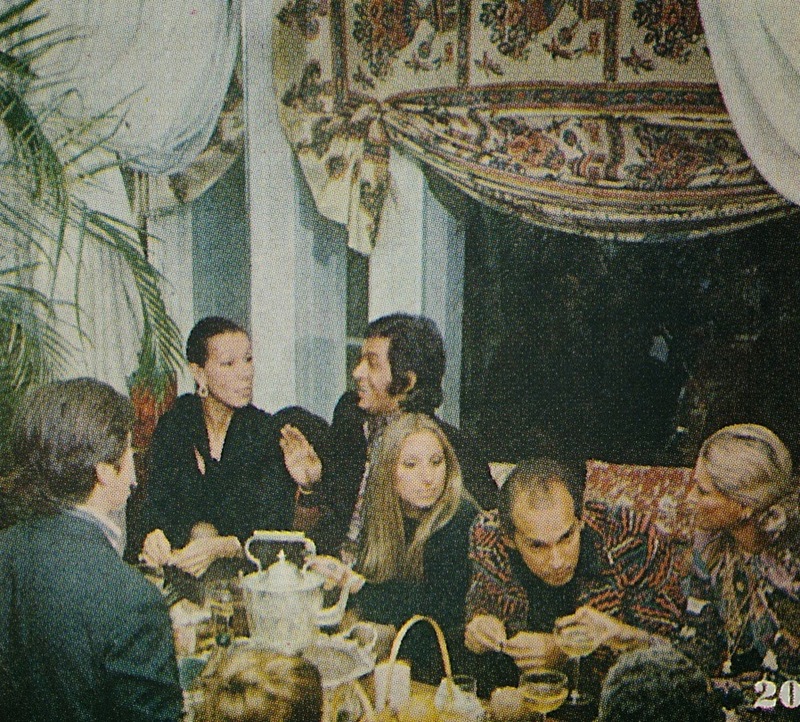 Valentino, Oscar and Françoise de la Renta, Barbra Streisand, and Nan Kempner seated together on one banquette. It doesn't get much better than that.